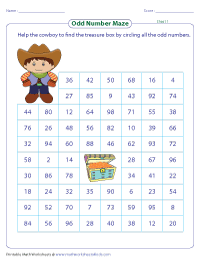 A variety of mazes to trace the path by coloring or circling either the odd or even numbers with a variety of themes are given in these worksheets. Try out all these interesting activities. Guide the lion, horse and the little bird to find the path to its den, stable and nest by circling all the odd numbers. 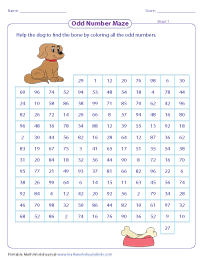 Help the playful puppy, naughty rat and fluffy bunny find their path to get their food by coloring all the odd numbers. Each worksheet has a distinctive theme. Find the path from the top to the middle by circling all the odd numbers. 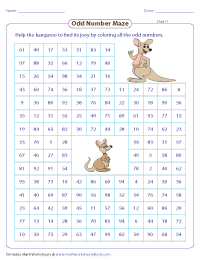 Help the tiger, elephant and kangaroo to find their little ones by coloring all the odd numbers in these worksheets. 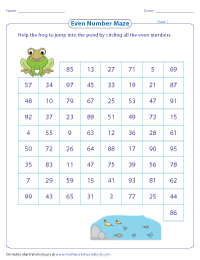 There are a number of places shown in these worksheets. 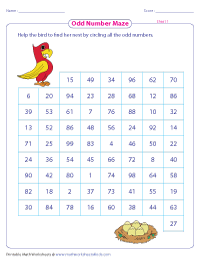 Guide the children to reach the correct destination by coloring all the odd numbers. Take the frog, buzzy bee and spider through the even numbers path by circling them to reach the pond, hive and web. An interesting activity for children is shown here. Identify the even numbered path and color them to help the animals and birds to catch their prey. A challenging path is to be traced. A path from the top to the middle is identified by moving along the even numbers and circling them to reach the goal. These animals are struggling to find their younger ones. 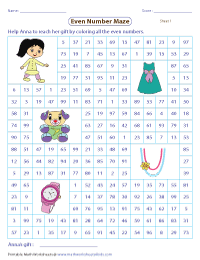 Help them to find their babies by coloring all the even numbers. 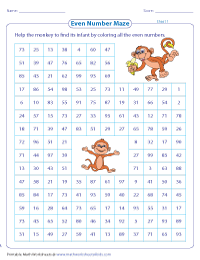 Different amusing themed worksheets are here for the children. 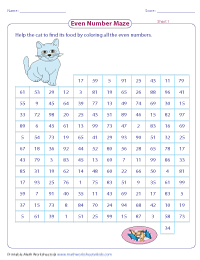 Perform this activity to reach or find the desired end point by coloring all even numbers.